The first coat of paint on any surface is always a primer. Most paints require an undercoat to help them adhere to a surface. Primers also even the surface so that the final coat looks smooth and even. The final coat of paint dictates the kind of primer to use on the surface. Besides providing an adherent surface, some primers contain rust inhibitors or additives that help hide serious stains. A primer can also increase the insulating properties of a surface by mixing ceramic powder with it. Any color can be painted over a primer. 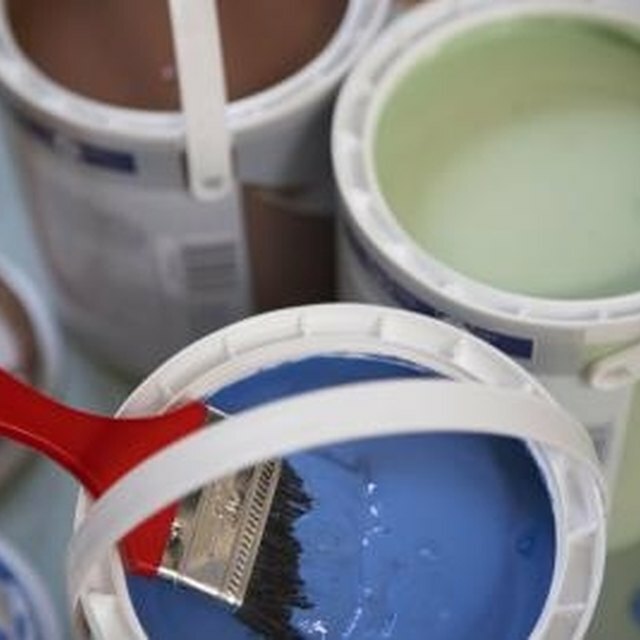 Latex and acrylic primers are water-based paints, the most common paint used to cover interior or exterior surfaces. The paint dries fast, is easy to apply and requires just water and a little soap for cleanup. These primers are not universal, however. Only water-based paints adhere to them, so if there might be a time when you want to use an oil-based paint in the future, a water-based primer may not be the best choice. Oil paint can be a good choice in high traffic areas, to cover stains or when used in cold temperatures. The primer for oil paints is also a universal primer, accepting both oil and latex paints. Cleaning brushes and rollers after using oil paint requires petroleum-based liquids, which are hazardous materials. Oil paint dries much more slowly than acrylic or latex paint. People who want to avoid the odors and gases associated with oil paint can use low volatile organic compounds (VOCs) oil paint and primer. Any metal surface must be painted with a primer to make sure the paint adheres to the surface. Since most metal surfaces stay outside, the primer coat is crucial so that the surface does not rust or corrode. The metal surfaces should be free of dust, rust and corrosion for maximum protection, and the label for the can needs to indicate that the primer contains rust inhibitors. Ceramic powder can add a degree of insulation to exterior walls, south- or west-facing interior walls or on the ceiling. The powders are available in mixed primer paint or sold in bulk for painters to mix into the paint themselves. Some of the insulating primers have low VOCs. Using insulating paint as the final coat over the insulated primer adds another layer of insulating properties, which helps moderate temperatures inside buildings.